"Sustaining DH" follows close upon the heels of "Sustaining MedArt," a project that investigated both the human-centered and technological ("socio-technical") factors that impact the long-term preservation of digital humanities projects. "Sustaining MedArt" culminated in the production of a website entitled The Socio-Technical Sustainability Roadmap (STSR) (www.sustainingdh.net), a resource that provides background information and a detailed scaffolding for exploring approaches to the long term sustainability of digital humanities projects. "Sustaining DH" supports the important work of taking the STSR "on the road," to institutions around the United States, for facilitated workshops. This project is generously funded by a grant from the National Endowment for the Humanities, Office of Digital Humanities. Approximately a year following the conclusion of our first NEH Research and Development Grant, the Visual Media Workshop team (with Dr. Alison Langmead at the helm) is embarking on its second NEH-funded project. 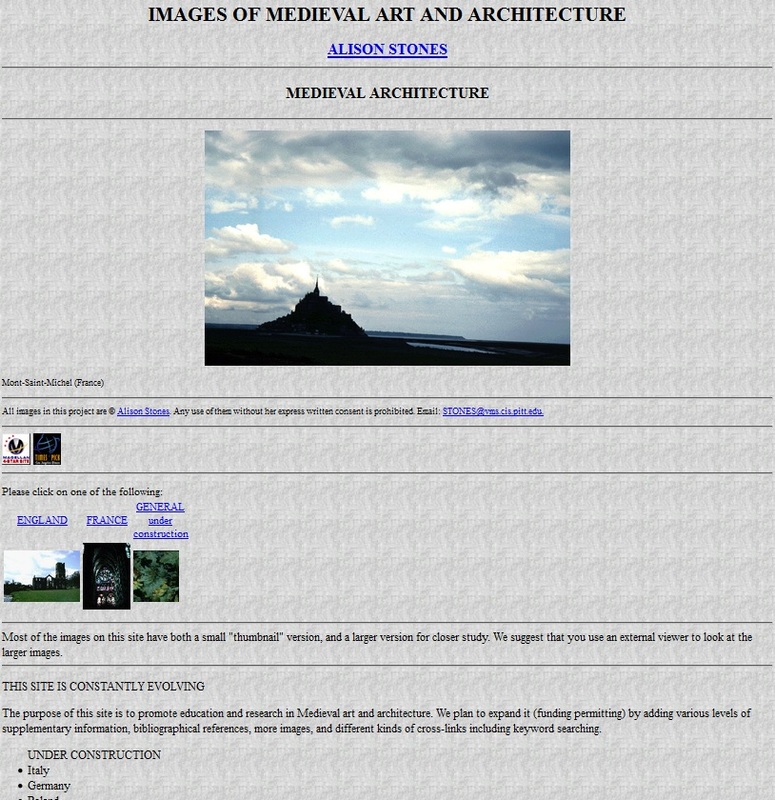 As some of you may recall, the first grant was dedicated to running an extensive case study of Images of Medieval Art and Architecture (http://www.medart.pitt.edu/), an early manifestation of a digital humanities project. The grant culminated in the creation of a website entitled The Socio-Technical Sustainability Roadmap (STSR) (www.sustainingdh.net), a resource for project managers interested in assessing the status and potential sustainability solutions for their digital projects. As part of this grant, we have also proposed specific mechanisms for engaging with workshop participants and other interested individuals beyond the in-person workshops, offering virtual "office hours," for example, and other resources throughout the granting period. More details on all of these activities will follow in the coming months! 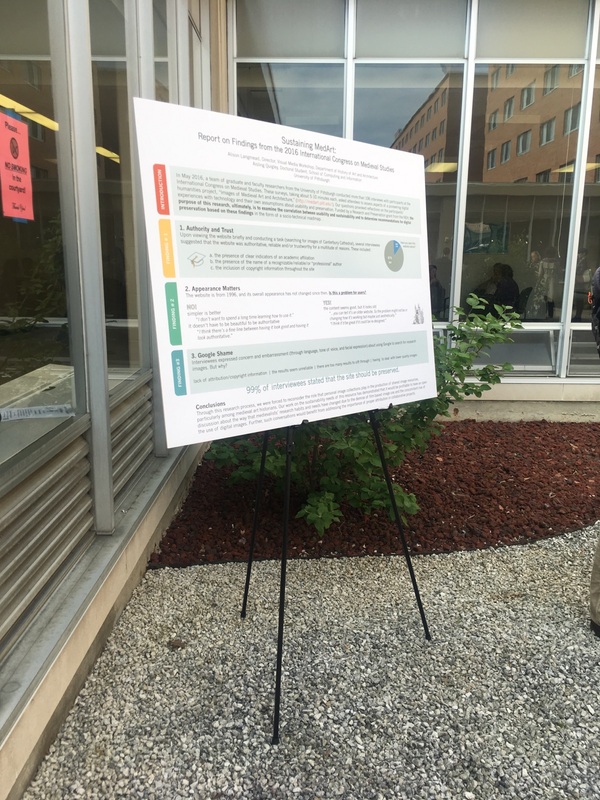 For the second year in a row, I had the distinct privilege of attending the International Congress on Medieval Studies in Kalamazoo, Michigan. According to the Medieval Congress' Twitter feed (@KzooICMS), this unique conference attracted almost 3,000 attendees this year. First, we asked of the attendees (mostly art historians): "How long do you want your research images to last?" ~41% selected "Until the end of my career"
~14% selected "Until the end of the research project (approx. 2-3 yrs)"
0 selected "Until the end of the week"
<1% selected "It doesn't matter to me"
Following this question, we asked: "How long do you expect your research images to last?" ~36% selected "Until the end of my career"
~23% selected "Until the end of the research project (approx. 2-3 yrs)"
<1% selected "Until the end of the week"
We then asked: "Is there a gap between your expectation and desire for image persistence, and are you concerned about it?" ~22% selected "I don't see a gap"
Finally, and perhaps, most importantly, we asked: "If you could store your research images communally, would you? 48% selected "Yes, in a heartbeat"
16% selected "Yes, I suppose"
32% selected "Maybe...talk to me more"
0 selected "No, it's fine"
Consider these as you will! We also presented the attached "rogue" poster at various wine hours throughout the Congress. For the past few weeks, I have worked on writing a reflection of my experiences thus far on the medart project. I did this partially as a way to wrap up my experiences this past semester and partially as a means to synthesize my work to make it more useful to the grant report. To write my reflection, I started by going through any notes and spreadsheets I have saved to my computer and by going through my Constellation posts. The process of going through my old blog posts has been really useful for creating a comprehensive reflection. Being able to use the blog posts also helped me to see how important writing detailed blog posts was. As it were, I had a detailed record of everything I had done the past two semesters that I could work from. I organized my reflection into five sections not including an introduction and conclusion. Each of the five sections was dedicated to one of the tasks I was assigned over the course of the past year. I lumped most of my earlier tasks like reading the grant, comparing file trees, and looking at the interview transcriptions into a section called “familiarization,” because each of these tasks were geared toward familiarizing me with medart. The remaining sections were “Metadata,” “The Wayback Machine,” “Finding Aids,” and “Urchin Reports.” In each section, I wrote about why the task was performed, what I did, any problems that were encountered, and what we discovered from this task. Hopefully, as a synthesis of the work I have done, this reflection will be useful to the grant report. I also took some time to write an introduction for the finding aids I wrote this semester. The finding aids will be in the appendix of the grant report. In the introduction, I provided background information on why we decided we needed finding aids and on the different versions of medart stored in the hard drive. I then went on to explain my method when creating the finding aids and the challenges that stemmed from the lack of consistent organization in the medart directories. Finally, I explained how the finding aids were organized and the best way to navigate them. After break, I will be returning in May after attending the 52nd International Congress on Medieval Studies at Western Michigan University in Kalamazoo, MI. I’m excited to talk with medievalists about what we have learned about medart and to hear Aisling and Alison present at their roundtable. During the summer semester, I look forward to working on the socio-technical roadmap for medart. It is early April, so the Sustaining MedArt team is once again preparing for the International Congress on Medieval Studies in Kalamazoo, Michigan. 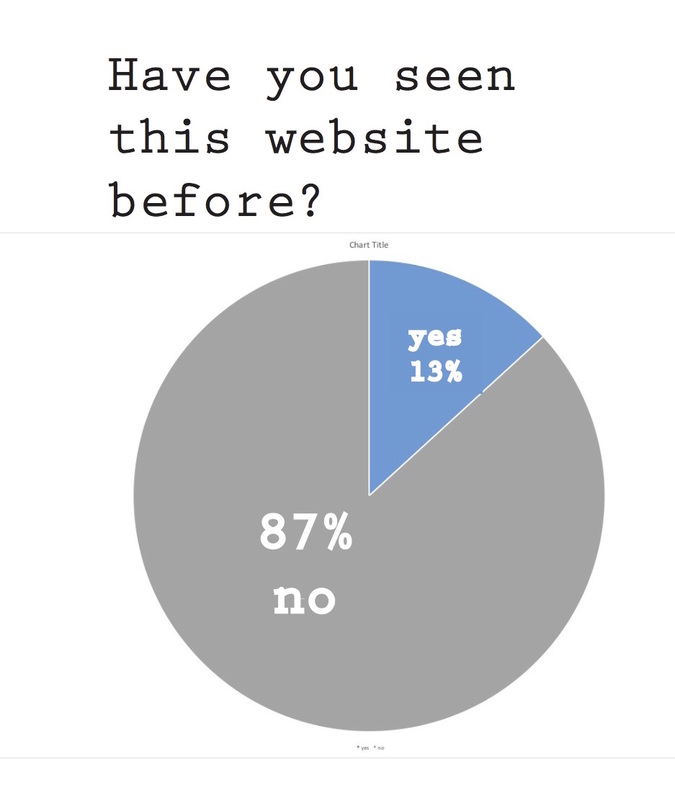 The project, originating with an initial usability survey in the autumn of 2014, explores the relationship between perceptions of site usability and sustainability. In particular, we entered this project wondering how user experiences correlate to preservation worthiness. In addition to preparing our grant report for the NEH (with ample input from Jedd Hakimi, in particular), Dr. Langmead and I are planning our portion of the Collective (A Roundtable). This collective presentation, listed on page 43 of the Medieval Congress 2017 program/tome, is sponsored by the Material Collective, “a collaborative of art historians and students of visual culture” seeking “to foster a safe space for alternative ways of thinking about projects.” For our participatory portion of this session, we will ask attendees to engage with questions about their personal collections of research images, among other things (await update in May!). We interviewed Dr. Alison Stones, co-creator of the MedArt, and Philip Maye, a major contributor to the site. From these interviews, we learned a great deal about the site’s origins and major moments of change throughout the past two decades. Lindsay Decker, our courageous MLIS-student researcher, thoroughly examined various iterations of the website through an analysis of the website’s file tree and the hard drive on which former instances are saved. Screen captures on the Internet Archive have played a vital role throughout this research as well. The end result? 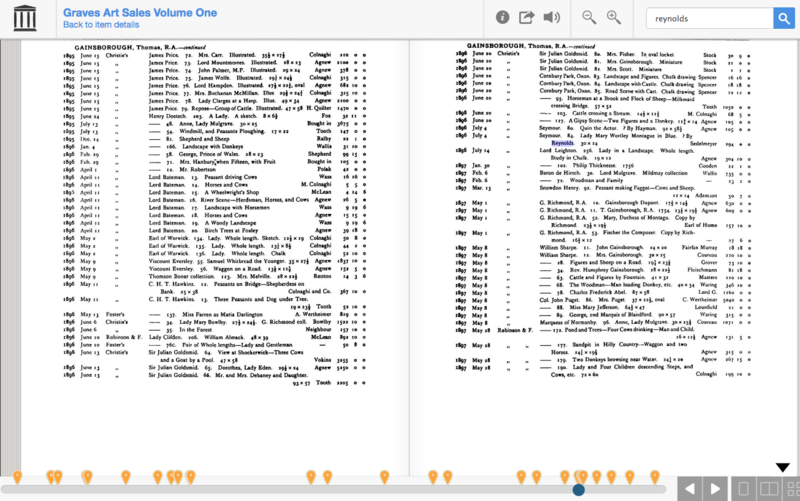 A comprehensive index of the site(s) modeled after an archival finding aid. Lindsay has blogged about her research processes here and here. Jedd Hakimi continues to research and write extensively in preparation for the final grant report. He has provided helpful frameworks for thinking about various aspects of the project throughout the past few months. I am producing an academic poster (WATCH THIS SPACE!) and am applying for various conferences (ditto). I will also be posting our presentation from Kalamazoo in late May! I’ve spent the past month analyzing an Urchin Report on the usage of Medart. Google Urchin was Google Analytics predecessor. I was using Urchin 7 which is the newest version, but it was released back in 2010, so there haven’t been any recent updates to it. I was warned that not every aspect of the software would work, and I found that to be true. There were no visitor data, but there were data on how many visits and hits there were to the site. Data on visit length did not appear consistently and neither did total bytes used. I was excited to find that Urchin had recorded bot activity, which gave me a more accurate depiction of site usage. We are more interested in use by real people, so I extracted bot hits from total hits to see how many real people used the site. However, Urchin states that it identifies bots by looking for “bot-like” activity which means there could be some inaccuracies. Therefore, while this data is helpful and shows some trends, it is possible that the information isn’t exact. I only had access to usage data from the past 18 months. 18 months initially consisted of Sept. 2015 to Feb. 2017, but since it is now March I have lost access to the Sept. 2015 data. Luckily, I had already recorded everything I needed from Sept. 2015 before the data disappeared. It appears that Urchin can only store 18 months of data at a time. Since I worked on this mostly in February, I’m going to focus this post on data from Sept. 2015 to Feb. 2017. When looking at total and average visits to medart, it looks like there is a slight low in the summer months and a spike beginning in Oct. 2016. However, when we look only at hits and take out the bots, it is clear that there is a consistent usage increase September to October with a peak in November for both 2015 and 2016. There is a slight dip in December but the lows are definitely in the summer months (June, July, August). This shows that activity by real people follows a pattern dictated by the academic calendar. The spike in visits that began in Oct. 2016 is likely a result of increased bot activity which has continued to the present, not because of increased use by real people. To reiterate, Urchin may not have accurately filtered out all the bots. One way we decided to combat any possibility of misinformation was by looking at hits to the glossary page. There’s no reason for bots to be overly interested in the glossary page, but it would be something people would use. We decided that by focusing on the glossary we might get a better idea of how many real people use medart. I found that the glossary page appeared as one of medart’s top 5 most visited content for the past 18 months. The glossary had 9,074 visits and was the third most visited page. In comparison, the home page had the most visits at 89,012. The vast difference in these numbers indicates that a large portion of home page visits could be bots. 9,074 visits are much closer to what we would expect from 18 months of usage. For each time period, Urchin would only give me information on the top 5 pages in medart. I went through month by month to see if the glossary was always in the top 5 content. The glossary didn’t show up in the top 5 content at all until September, 2016. It is possible that the glossary rose in popularity as a result of the Sustaining Medart team’s visit to Kalamazoo in May, 2016. Medart’s top 5 content consistently included the home page and the main menu pages for France and England, but interestingly enough, medart’s page on the Tower of London also appeared consistently. In fact, this page was the fifth most visited page overall for the past year and a half. The Tower of London page got 7,096 visits, and users spent an average of 6 minutes and 12 seconds on it. This is compared to the glossary which saw 3 minutes of average time spent. Of all the top 5 content, users spent the most time per visit with the Tower of London page. This activity did not sound like bot activity, so why were so many users spending so much time on this page? I dug a little deeper and found that the Tower of London was in the top 5 all 18 months except during July, August, and September of 2016 with a low in Dec. 2015 and a peak in March, 2016. This very nearly mimics the academic calendar, so it could be something used for classes. I wanted to know how people were finding this page so I googled “Tower of London Medieval Timeline” and looked under google images. An image from the Tower of London page was one of the first to come up. I found that someone had posted a link to this page on Pinterest. After some more searching I found two more images from medart saved to Pinterest. It’s exciting to see medart integrated into social media, and to see the effect it can have on site usage. It was good that I was able to get some insight on how actual people found medart. According to the Urchin Report, everyone who used medart got there by typing in the URL. This is extremely unlikely which is why I did some actual searching to get this information. I did a similar search to find out how people were getting to the glossary. I googled “medieval glossary” and medart’s glossary was the ninth result. I checked through the other results to see if any linked to medart but didn’t find anything. People certainly can get to the glossary this way, but I think it’s more likely that usage increased because of the presentation at Kalamazoo in May. Overall, the Urchin Reports presented us with a lot of really helpful information. We got further validation that medart usage revolves around the academic calendar, and we were able to look more closely at bot activity on the site. The Urchin Report also led me to discover other ways people have linked to medart, such as through Pinterest. I recently finished the finding aid for PITT_EDU–medart. PITT_EDU–medart is a folder containing the earliest version of medart. It was the primary directory for medart until they created VRCOLL out of a need for more storage space. However, instead of moving the contents of PITT_EDU–medart onto VRCOLL, they continued to maintain it. PITT_EDU–medart served as the nucleus of medart in that the contents of VRCOLL often linked back to material in PITT_EDU–medart. Some of what’s on PITT_EDU–medart is no longer active on the medart site or in some cases never was. In this way PITT_EDU–medart is very much like a time capsule of medart’s history. PITT_EDU–medart includes relics of medart’s past such as course materials from Alison Stones’ “Introduction of Medieval Art and Architecture” classes. We know from interviewing Alison and by reading her work that medart was intended as a classroom tool. The course materials are further evidence of this. Assignment outlines, images to be used in assignments, and quizzes on vocabulary are some examples of course materials found on PITT_EDU–medart. There is also evidence of experimentation in PITT_EDU–medart. I found a version of the search feature that I hadn’t seen before. This further emphasizes that they considered a search feature but must have determined it wouldn’t work for medart since it was never made live on the site. The wording on the search feature (can be seen in the above image) indicates doubt on the part of its creator in regard to its functionality. It’s possible that it wasn’t that they didn’t think a search feature would work for medart, but rather couldn’t get the search feature to workv period. Another interesting discovery while creating the PITT_EDU–medart finding aid was consistency in the inaccuracy of France’s alphabetical categories. Instead of a long list of sites in France, they are organized into sections such as A-C or D-K etc. However, when exploring the file trees I noticed that A-C or D-K was not always an accurate title for a particular section. For example, D-K has starts with Chadenac and ends with Montmouillon, L-Z starts with Lacharite and ends with Metz, N-R starts with Montmouillon and ends with Rouen. It was interesting to see these inaccuracies reflected in the hard drive. On the current medart website the sites are organized into the correct sections. Creating this finding aid has given me the opportunity to evaluate the differences and connections between the VRCOLL and PITT_EDU–medart directories as well as with projects I worked on earlier this year. To start the semester, I finished a finding aid I had started last semester. The finding aid was for VRCOLL-medart,one of the versions of medart we have stored on a hard drive. VRCOLL-medart is that largest of the three versions of medart, and the finding aid, as it is now, is 16 pages long. I set up the finding aid by listing the main folders and then recording either a summary of its contents or a detailed account. A lot of the finding aid had to be done on a case by case basis, because there really was no steady consistency to the organization of VRCOLL-medart. Some folders were titled after a monument and everything in the folder was used for medart’s webpage on that monument. Other folders might be named “Business Cards” and contain a to-do list for a grad student, instructions on how to create an image retrieval link, a file that can’t be opened named “History-of-medart,” and not a single reference to business cards. In cases like that I had to list everything that was in the folder because there would be no way to summarize it other than “miscellaneous files,” in which case half the folders in VRCOLL-medart would be labeled as such. The lack of consistency certainly contributed to the length of the finding aid. The reason for the disorganization of VRCOLL-medart might be simply because it was used for so long and by so many different people. Collaborative efforts by many graduate students with different organization strategies are probably the greatest reason for the inconsistencies. Another is the sheer size of VRCOLL-medart, which consists of 116 GB, far larger than any other version of medart we have. VRCOLL-medart is larger, because it also houses images and information for the Chartres website which was a separate project run by some of the same people. One aspect of VRCOLL-medart I found particularly interesting were the folders dedicated to specific countries. The medart website has images only of France and England, but VRCOLL-medart has folders for the Czech Republic, Germany, Greece, Italy, Poland, and Spain. At first, I thought these folders only contained images from these countries and that medart never had the time or funding to make webpages for them and put them up in medart. But interestingly enough there are multiple html webpages for each country including homepages for all of them except the Czech Republic. So the question is why did they not add the webpages and images to medart if they had already created them? All in all taking the time to thoroughly sweep VRCOLL-medart has provided us with quite a bit of useful information. There was email correspondence saved in VRCOLL-medart concerning requests to use medart images, questions about medart, and conversations between medart’s creators. I also found a presentation two of the graduate students who worked on medart gave at a conference that gives us insight on their thoughts on medart and how it was intended to be used. There were also usage stats and a great deal of other information in VRCOLL-medart that will be useful to our understanding of medart’s history. I’m interested to discover more about medart from the other two versions of it we have. Recently, I have taken some time to explore the changes made to medart’s menu page for England (menuengland). Some of the most drastic changes to medart occurred on this page. In the earliest snapshot we have of menuengland from 12.25.1996 the user had to navigate to the images they wanted through a map. The user had to click on the location of whichever monument they wanted images of. They did have a link to an alphabetic site list one could choose as an alternative to the map. In 2000, they increased the size of the map and made the alternative site list a more prominent feature on the site. By 2008, the map had been eradicated and the only navigation option was through the site list. I wanted to dig deeper into the reasons these changes were made and discovered a number of possibilities. My understanding is that the map used on the menuengland page of medart from 1996-2008 is an image map. One definition of an image map “is a list of coordinates relating to a specific image, created in order to hyperlink areas of the image to different destinations (as opposed to a normal image link, in which the entire area of the image links to a single destination),” (Wikipedia 2016). This essentially is what the map on menuengland does. There have been two different types of image maps. Server-side image maps were the first type and were used starting in 1993. The second type of image map is a client-side image map, and those were used starting in January of 1997. Therefore, we can assume that at least at first menuengland was using a server-side image map. I’m a little fuzzy on the different between a server-side and client-side image map, but I think it has to do with how the browser finds the URL you’ve clicked on within the image map. People had a lot of trouble with server-side image maps, because the browser didn’t always understand where to send the user. Now if you happen to see an image map on the web (the sites I was on seemed to scoff at the continued use of image maps and referred to them as “mystery-meat navigation”) it’s almost always client-side (Bloom). The modifications to menuengland happened primarily in 1998 (35%), 2000 (21%), and 2001 (38%). After 2001 it was only modified once each in 2008 and 2009 and then twice in 2014 that I can tell. The modifications may have been more frequent in 1998 because they were switching to the newly invented client-side image map. Then in 1999 the Web Content Access Guidelines (WCAG) 1.0 was published. WCAG 1.0 mentions image maps quite a bit, because they are inaccessible to someone using a keyboard. They recommend web developers provide a text equivalent when using an image map (W3C 1999). This could explain the changes in 2000 and 2001. In 2000, they changed menuengland by enlarging the map and making the site list (their alternative to the image map) more prominent. Previously, the site list was at the bottom of the page, and after 2000 it was moved to the top of the page and enlarged. They also added an option to explore the sites by category. This may have been an attempt to better comply with the WCAG or at least to make the site more accessible. The image map was not fully removed until 2008. From the Wayback Machine I can tell the image map was removed sometime between 5/9/2008 and 12/16/2008. However, upon looking at the metadata I was able to find an exact date since there was only one modification in 2008: 10/7/2008. This is very near to when WCAG 2.0 was published (December 11, 2008). WCAG 2.0 similarly condemned image maps and urged web developers to provide alternatives to users who needed assistive technologies to use a computer (W3C 2008). Medart removed the image map prior to the release of WCAG 2.0, but if it was a hot topic at the time they may still have removed it for accessibility reasons. They replaced the image map with a site list organized alphabetically and created an identical one for menufrance. Connecting the actions of the creators of medart to what was going on in the world of web development is both enlightening and exciting. Adding that context gives the changes made to medart more meaning. The changes they made to menuengland were likely not made on a whim to improve aesthetics or style but instead to improve the accessibility of the site and extend its usefulness to more people. References Bloom, Zack. 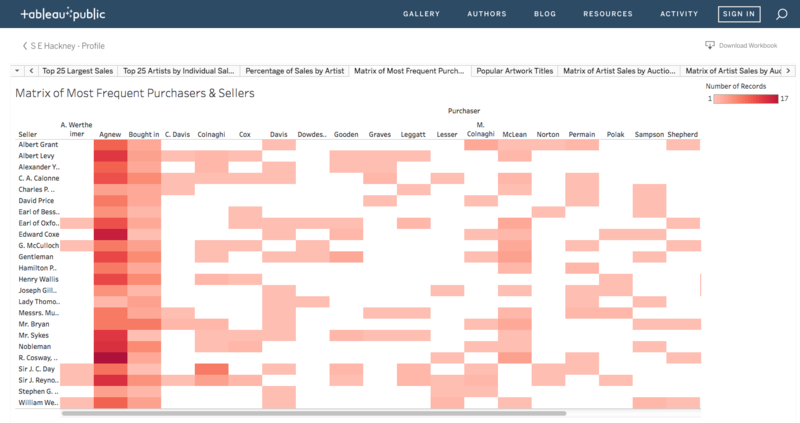 “A Quick History of Image Maps.” Eager. Accessed November 28, 2016. https://eager.io/blog/a-quick-history-of-image-maps/. W3C. 1999. “Web Content Accessibility Guidelines.” Last modified May 5, 1999. http://www.w3.org/TR/WCAG10. W3C. 2008. “Web Content Accessibility Guidelines.” Last Modified December 11, 2008. http://www.w3.org/TR/WCAG20/. Wikipedia. 2016. “Image Map.” Last modified November 11, 2016. https://en.wikipedia.org/wiki/Image_map. With the help of Matt Burton we were able to successfully extract metadata from the medart folders via unix commands. 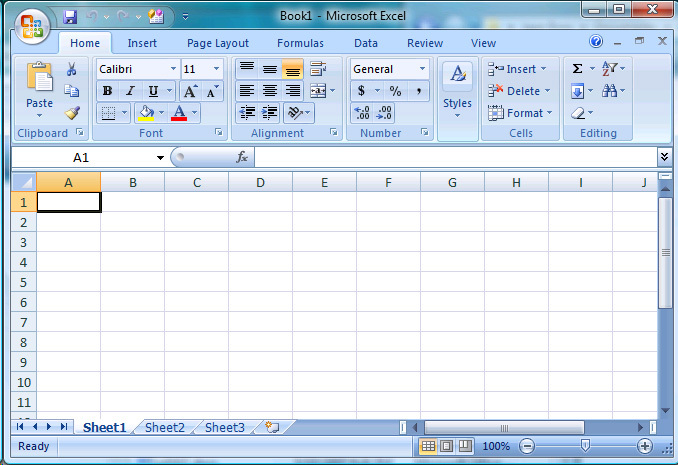 We have since imported that data into an excel spreadsheet from which we have begun analyzing and organizing our findings. I have been specifically looking at when which directories were most frequently modified and which file types were used most prominently. Unsurprisingly, the files are overwhelmingly jpgs followed by gifs and the directory with the most files by far is the “image” directory. We have also looked at which months showed the most activity and have found that their actions directly reflect the school year with the most modifications taking place in May and June and the fewest during the winter holidays in December and January. Unfortunately, we have only been able to find the date modified for these folders. Every avenue I have tried in my attempts to find the date created has yielded either November 4, 2014 (long after medart was created) or January 1, 1970 (long before medart was even thought of). While we will continue to look for new ways to capture the date created of these files, in the meantime there is a lot that can be learned from the metadata we already have. Also, while combing through the data I came across a folder titled “Kalamazoo.” In it I found presentation outlines for the 2009 International Congress on Medieval Studies. The Sustaining Medart team attended this same conference in May 2016 and will again in 2017. In 2009 two of medart’s primary creators, Jane Vadnal and Phil Maye, presented on medart. While we don’t have their actual presentations the outlines do give us some insight into the creation of medart and the intentions behind it. For example, we now know medart began as a way to turn Alison Stones’ course materials into webpages. Studying medart is constantly leading us to new surprises and discoveries at every turn. I’m excited to see what we will find next as we put more and more pieces of the medart puzzle together. As Graves’ data becomes available and conceptualized in visually informative ways, we’re investigating ways in which the data can turn into objects that we can track through Itinera (itinera.pitt.edu). By honing and creating more geographically specific locations for these entities and tracking works of art through Graves' art sales, the VMW cohort under Brewer’s guidance is working toward diversifying Itinera by mapping the European and non-Western routes of lesser tracked populations such as influential women and people of color through 18th-century Eastern Europe and Turkey. In our attention to multiple scales and modalities of historical vision, our attention focuses on the questions, how can we visualize and generate new insights into the travels of 18th-century travelers through contemporary identity politics and digital mapping methods? Furthermore, how can mapping diverse populations in this time over this space creating meaning through historical place-making? 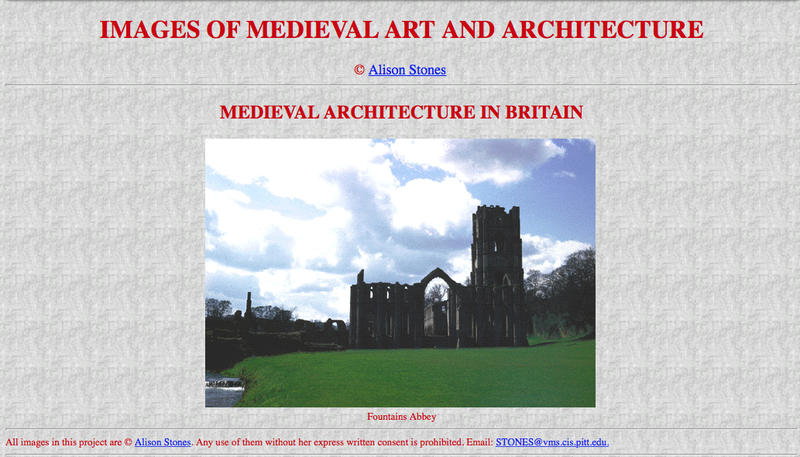 As the end of the term approaches, the Sustaining MedArt team lead by Aisling Quigley continues to unearth and reconstruct the socio-technical history of the website, Images of Medieval Art and Architecture (www.medart.pitt.edu). While the digital forensics research has provided helpful insights into the foundations of the site, this work has been arduous. The digital forensics tools are complex and uncooperative, and the dissection of the site itself has revealed a tangle of messy innards. Despite numerous obstacles, however, our team perseveres undaunted! Indeed, the complexities are revelatory in and of themselves, and the data is slowly but surely bringing to light important moments in the website creation process. Following from this work, the team, comprised of Quigley, Lindsay Decker (read Decker's reflections on the subject here), and Jedd Hakimi, is discussing and establishing a firm infrastructure for developing a socio-technical digital preservation roadmap. Undergraduate researcher Dheeraj K. Jalluri works on a neuroaesthetic research project investigating neural basis of artistic aesthetic experience in Abstract Expressionist art under Brewer's guidance. This semester, he is focusing on formulating a method to quantitatively analyze artwork qualities implicated in neuroaesthetic theories, such as symmetry and contrast and value using Photoshop. In future exploration, he gears his tools toward the crowd-sourcing tool Mechanical Turk and Fourier Analysis in the development of a larger research question that best suits these methods. As an invitation to inter-institutional connection and networking, those interested in our efforts toward constructing bridges to other digital humanities spaces can follow #arthistory on our Digital Humanities Slack (https://t.co/BI1cizC4de) and through our new listserv at https://list.pitt.edu/mailman/listinfo/ddarth.